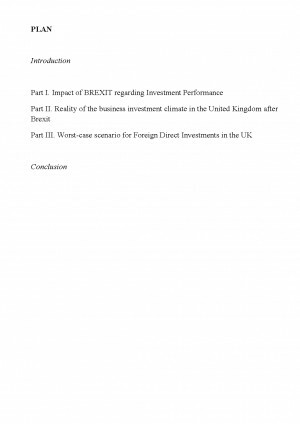 The mooted importance of the UK's membership of the EU as a lure for Foreign Direct Investment (FDI) has long been stressed by supporters of the UK's continued involvement in the EU. In this view, foreign firms see the UK as a gateway to other EU markets, with the UK economy benefiting from its resulting attractiveness as a location for activity. 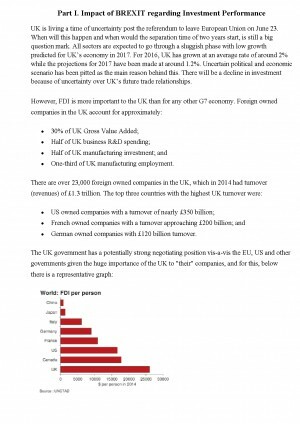 The UK is certainly a major recipient of FDI. In 2014, it held the second largest stock of inward investment in the world, amounting to just over GBP1 trillion or almost 7% of the global total. This was more than double the 3% accounted for by Germany and France. 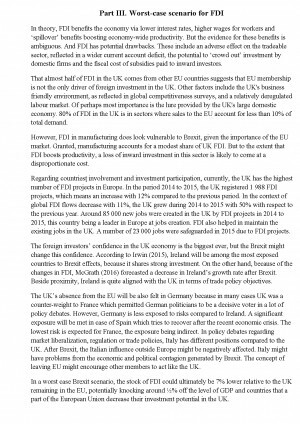 On a per capita basis, the UK is the clear front-runner among major economies with a stock of FDI around three times larger than the level in other major European economies and 50% larger than in the US. 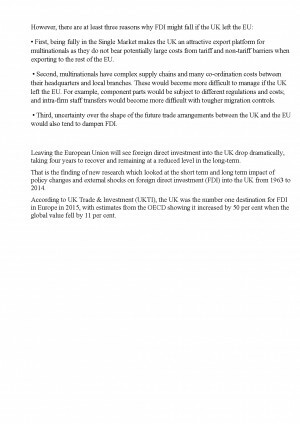 The potential for a departure from the EU to undermine the UK's attractiveness as a location for Foreign Direct Investment (FDI) is often cited as one of the key risks were the UK to leave the EU. 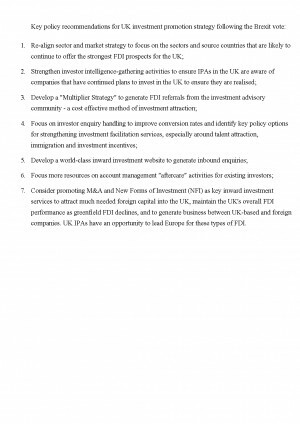 In weighing up the threat to FDI posed by 'Brexit' this project assesses the net gain from inward investment and the role played by EU membership in attracting FDI. UK is living a time of uncertainty post the referendum to leave European Union on June 23. When will this happen and when would the separation time of two years start, is still a big question mark. All sectors are expected to go through a sluggish phase with low growth predicted for UK's economy in 2017. 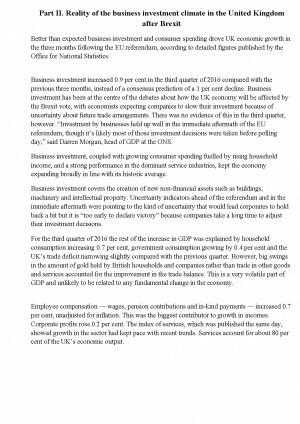 For 2016, UK has grown at an average rate of around 2% while the projections for 2017 have been made at around 1.2%. Uncertain political and economic scenario has been pitted as the main reason behind this. 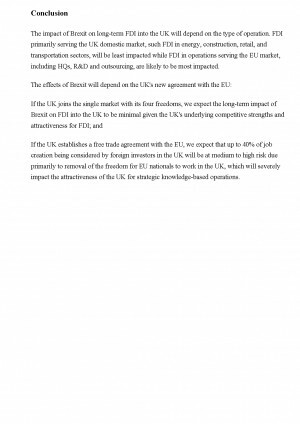 There will be a decline in investment because of uncertainty over UK's future trade relationships. - One-third of UK manufacturing employment. - German owned companies with GBP120 billion turnover. 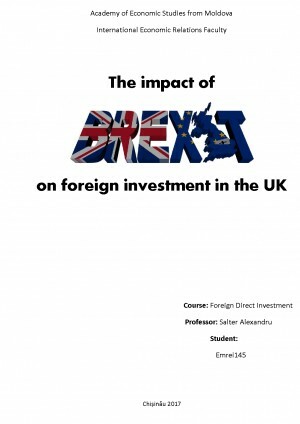 Descarcă referatul cu titlul "The impact of Brexit on foreign investment in the UK" cu plata prin SMS pentru 4 € + TVA. Plătești un referat și primești 2 (al doilea gratis).